INTO THE CONVENTIONAL AR 7 PLASTIC STOCK. IF YOU INTEND TO USE THIS STOCK,A REMOVABLE MOUNT IS NEEDED. The AR-7 survival rifle is a light, compact, 7 shot, 22 caliber semi automatic rifle that is popular with hikers, campers, and pilots. First produced In the early 1j960s by the Armalite Corp., the AR-7 was originally designed as a survival weapon for downed Air Force crews. A silenced version was also built by the government during the Viet Nam War. The rifle Is currently manufactured by Charter Arms Corp. and retails for $75. FFL holders can buy the rifle wholesale for about $54. There are four major parts to the rifle: the barrel, stock, receiver, and the magazine. When disassembled, all parts are contained in the floating, waterproof stock. The AR-7 rifle can be used as the basis of a complete mini weapons system designed to be carried in a small attache' case. The original stock and 7 shot magazine are not used with this system, but should be retained for possible future use. In addition to the basic receiver and barrel assembly, the following parts are needed to build the new system. 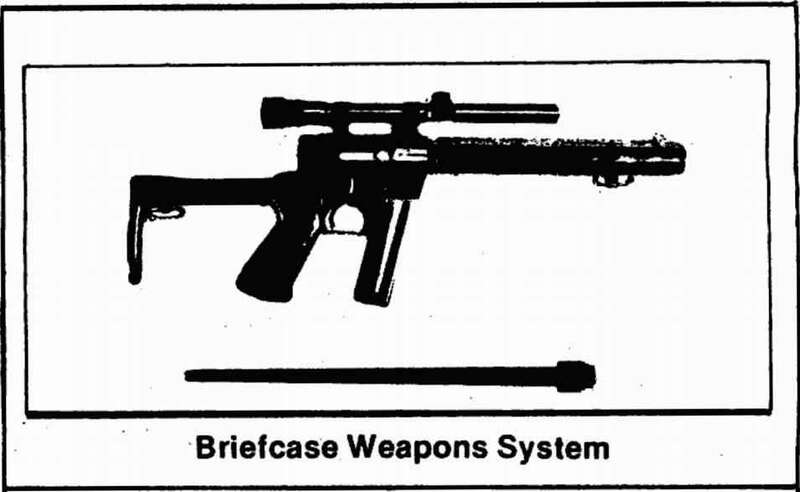 The system allows a variety of weapons to be assembled. The whole works can be built for about $100. - Oil for drilling and tapping. - Drill motor or hand drill. - Rubbing alcohol to degrease before gluing. 320 grit. 1 - Small piece of modeling clay. - Hacksaw, Padded Vise, Center Punch. A. Using the hacksaw and padded vise, cut the scope mount as shown in Fig. #1. Sand all rough edges smooth. NOTE: scratch a snail 1 F ' for front in the slot at the front of the mount. B. Use coarse sandpaper to roughen the bottom (curved) surface of the mount. Wash the mount in alcohol and dry with a clean towel. C. Place the mount on a flat, smooth surface. Fill all screw holes with clay. Clay is also used to make a small "dam" at each end of the mount. 0. Mix enough epoxy to fill up the area created by the curve and dams at each end. The epoxy should be slightly "piled up" on the mount.See Fig. #2. ALLOW TO DRY OVERNIGHT Even if It says 5 or 10 min. epoxy. E. Glue a piece of 220- 320 grit wet or dry sandpaper to a large piece of glass. Sand off the excess epoxy from the scope mount base by sliding it across the sandpaper. Check the progress often to be sure you aren't applying all the pressure to the ends This will create a rocking chair effect, instead of the absolute flat bottom desired. Stop sanding when a bare aluminum line appears on both sides. Check the mount for flatness on an open area of the glass. See Fig. #3. Spot sand any high areas that are found. Place the mount, epoxy down, on a hard flat wood surface and drill through the mount holes and epoxy underneath. Enlarge the holes in the epoxy with a sharp pointed knife.The screws should slip through the holes in the mount without resistance. G. Disassemble the receiver as per the gun's enclosed instruction sheet Remove all internal parts except for the safety lever assembly which is left in place. Clamp the receiver in the padded vise. See Fig. #4. There are 10 true ribs on the top of the receiver (12 if you count the shorty on each side). Find the center groove of this area and use a scriber or knife point to scratch a line the length of the groove. It should be bright silver and constrast well with the black background. Use a center punch to mark this groove at the following points, as measured from the front edge of the groove. See Fig.5 3/4",1-1/4",1-5/8",2-1/8",3-13/16"
7/64" drill. Go slow and keep the drill as vertical as possible. Squirt a drop of oil in each threaded hole. Place the mount on the receiver and start the five screws by hand. If one or more won't start, elongate the hole in the mount until the screw will thread into the receiver below. K. Run all five screws down snug and check that the mount is in complete contact with the receiver without any gaps. An easy way to do this test is to hold the unit up to a window and look at the side of the mount-receiver joint. If no light is seen, fine. If large gaps appear,one or more of the screws is probably rubbing against the side of the hole in the mount, which distorts it and prevents a flush fit. Elongate any problem holes as in J. When a flat fit is obtained, all 5 screws should be tightened - BEWARE - you are plenty tough to strip all 5 holes of their threads, so use moderation when tightening. About 1/16" of each screw will be protruding into the top area of the receiver's interior. Remove each screw individually and file or grind off material until the screw is slightly recessed into the top of the receiver when tightened in place After grinding, be sure to cleanup any ragged threads on the screw ends. These will easily strip out the soft aluminum threads. With all 5 screws tightened in place, run your finger along the top inside of the receiver. You should feel nothing but 5 shallow holes. See Fig. 6. M. Mount scope, and set both adjustment knobs to a central setting. Sight the rifle in at 25 feet, using a large white sheet of paper. When the scope is sighted in, you should still have plenty of adjustment left in all 4 directions, i.e. up,down, left,right - to later compensate for any slight alignment differences. If one or both controls is turned to its extreme before the scope is centered, the mount will have to be adjusted. Enlarge the holes with a knife or round file. The tapered screw head will fill the larger hole. If the mount is to be moved to the right, make the oversized holes slightly to the left of center, do the opposite for right to left. Continue this process until the scope is sighted to center, with both scope controls in a near neutral position. Up and down is easier; a shim or series of shims is slipped under the front of the mount to correct high shooting, and under the rear for low shooting. See Fig. 7. Shims of hard plastic or metal may be used. If the shimming is very extreme, the screws will be too short, and it will be necessary to replace them with a longer unit. N. Alignment is rarely this far off, Fut if you wish, an alternate method may be used. Drill and tap the front and rear holes only. Clean and reassemble the gun. Clamp the rifle in place with a portable vice or heavy sand bags. Adjust both up/down and left/right scope controls to a central position and install scope and mount on rifle. If the scope is aimed at a point fairly close to the point of bullet impact, minor adjustment is all that is necessary. Drill and tap the remaining 3 holes. If the bullet and scopc are grossly misaligned right to left, the front, rear, or both holes will have to be enlarged slightly off center as in step M above. Vertical misalignment is again handled with shims. When the unit is finally aligned, drill and tap for the remaining 3 screws. Remember, when enlarging the holes for adjustment, to remove the excess screw length that may now protrude into the inside of the receiver. NOTE: If you can't fire the rifle, do step W by removing the bolt and rear sight screw. The scope is aligned with the point that is seen when looking through the rear of the receiver and sighting down the barrel. This is a crude form of BORE SIGHTING. ,0. When you are satisfied with the mount's alignment, roughen the receiver and mount contact areas with coarse sandpaper. Clean all parts, especially the screws and the threaded holes with alcohol. Epoxy the mount to the gun, as well as each screw into it's appropriate hole.Replace any shims that had been in place before cleaning. Let 1t dry AT LEAST 24 HOURS before firing. If in the future you need to remove the mount, the epoxy bond 1s broken with heat: Take off the scope and disassemble the receiver. Heat the mount and receiver to about 300° or until the epoxy melts. Three years ago, I began to design modifications for the AR - 7 rifle. I asked several gunsmiths about a provision for mounting a scope, either by screwing on a base or cutting a dovetail directly into the receiver. "Can't be done, too soft, insufficient wall thickness, threads will strip out, etc.etc." After some experimenting it was discovered that by using coarse threaded screws, they resisted stripping of the threads. This led to the design presented in issue #3. As stated, this unit is unacceptable if the storage feature of the original stock is to be retained. A number of so-so clamp-on removable mounts were then produced, and were to be the basis of this article. For the hell of it, I also revived the integral dovetail idea, and cut one in an old AR 7. If nothing else, I wanted to see where it would crack. It didn't crack. It works perfectly. The horizontal top surface of the Receiver is even close enough to bore alignment to allow the slight error to be corrected with the internal scope adjustments. It's so simple a 'how-to' article isn't even necessary. Just clamp the receiver in a padded vise and file a 1V' along both sides of the ribbed top of the receiver. A small amount of the vertical rib behind the chamber on the right side must also be filed away, but no loss of strength was noted. Continue to file until standard claw mount .22 scope rings can be installed. Before reassembling the gun, bore sight it as described in issue #3, and adjust as needed. The scope is easily removed for storing the rifle in the stock and the original sights remain intact. This is especially nice in a survival rifle. When the scope breaks or malfunctions, a back-up sighting system is invaluable.